What goes through your mind when you see a photo like this? 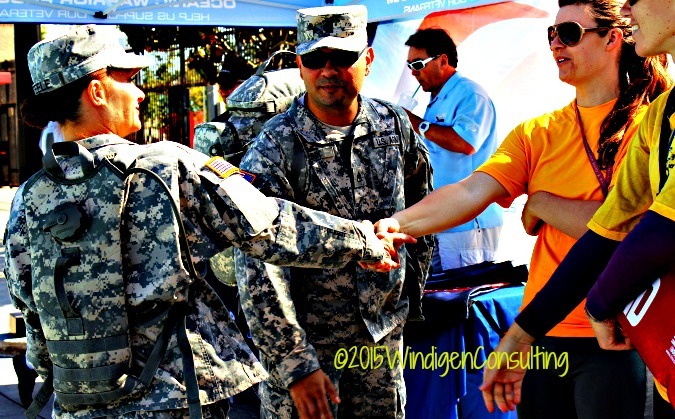 Military personnel shaking hands with the lifeguards…but why? People come to public pools all the time, why is this any different? This photo captured the end of an event held for the Wounded Warriors in Sacramento at a public swimming pool. The lifeguards in the yellow shirts were also Pool Managers who have been involved with teaching children and adults with disabilities how to swim. What the photo does not show is there were a number of wounded warriors taking free SCUBA lessons earlier as part of a larger event involving swimming, softball, climbing wall, and track and field events. All of the participants served our country (USA) overseas, but came back with a variety of conditions and disabilities. Our recreation department partnered with Sacramento Wounded Warriors to provide leisure education, experiences and opportunities to explore new leisure pastimes. Imagine yourself a swimmer, able to use your arms and legs…you don’t even give it a second thought. Now imagine coming back with a devastating injury that leaves you without the use of your arms and think about how you would swim with that disability. Leisure Education provides, in this case, a new way to use the abilities one has, to experience the same leisure activities, using modifications to manipulate the equipment or one’s body. If unable to do the same activity, then a person may try a new activity, which can be modified to work with the person’s new abilities. Sort of like getting your second wind. In the swimming pool, were several men and women, all of varying degrees of ability, participating in SCUBA. One man in particular, was successfully swimming along…with NO ARMS AND LEGS. With assistance and some modifications, he was able to experience a leisure activity that he figured would be lost to him forever, due to his disability. At the end of the SCUBA lesson, many of the military personnel introduced themselves to the lifeguards and thanked them for their time. That is my daughter on the right in the photo. She was amazed at the man’s ability to swim without his arms and legs. This experience helped motivate her to explore her education in Recreation Therapy. I have been diligently working on my second act. My consulting business has launched. Under Windigen Consulting, Second Wind Leisure offers services in the form of coaching, support, and encouragement to help people identify their leisure opportunities. More about that later. But feel free to check out the website. Think twice today about how your life would be impacted if you became disabled and were unable to continue your favorite leisure activity. I would love to hear what you think. This photo is the third entry in the Five Day Challenge. I was invited by Terry, from Through the Lens of My Life to participate in the Five Days Challenge, which asks us to post five photos, one per day for five days, and to write a story to go with each photo. For each day that we post we are supposed to invite one person to participate. Today I’m inviting Helen from Inn By the Sea Kamakura, who already takes amazing photos on her blog. Stop by and take a look! If you would like to participate, post a photo every day for five days and write a story to go along with each photo. Your story can be fiction or non-fiction. It can be a short paragraph, a page, or a poem. Each day, please select one person to carry on the challenge. The challenge is not mandatory and can be refused. I hope you accept and have fun! Great photo and lovely programme! Thanks so much for the nomination. I’ll do my best! Terri, what an excellent program! I didn’t know that anything like this existed. It brings people beyond physical therapy. In perhaps some ways it’s similar to occupational therapy. Wishing you all the best with your consulting! Thanks, Terry! It is similar to Occupational Therapy but it’s known as Recreation Therapy 🙂 I still have a couple more days on the 5 day challenge! Wonderful program. Thanks for sharing. And congrats with the birth of your business. Way to go! What a great way to honor our vets! The Wounded Warrior program is big in San Diego too. A couple of times a years about 50 of our sports car club members meet at a local hospital and take any who sign up for a drive over the windy back country roads and then we stop for big lunch. They love to get out and drive fast (of course NONE of us ever exceed the speed limit) and we love to spend the day with these brave men and women. Thanks, Janis! That sounds like an amazing event. I would love to be able to teach a leisure ed class in San Diego as part of my business. I’ll have to work on that. I’m coming to SD in a couple of weeks, we should do breakfast or lunch!! Let me know when you’ll be here and we can try to coordinate something. Very interesting. I cannot even imagine having to live the rest of my life with devastating disaiblities. However, so many many of our young soldiers came home with these. It is wonderful there are programs like this for them. We were honored to be able to offer them. Absolutely! I can see why. What a great program! Being disabled myself, one of the things that hurts the worst is that I can not play the drums as long as I used to. I haven’t lost limbs or anything (thankfully) but effects from cancer have really messed me up, physically and mentally. I wasn’t able to play for years but am finally working back into it. It is good to have something fun to take your mind away from all the trauma. Thanks for the comment, Josh, and for sharing! Wise us of leisure time is therapeutic for anyone. I’m very glad to hear that you can still enjoy your passion!